The Queen Elizabeth's sister ship, the QE2, will become a hotel. A shipping company is to build a 92,000 tonne liner which will be called the Queen Elizabeth. The ship, which will be based at Southampton, will carry 2,092 passengers and more than 1,000 crew. Shipping firm Cunard also operates the QE2 liner, which will leave service next year to become a floating hotel in Dubai from 2009. The decision to build the vessel was prompted by the demand for cruises on Cunard's new ship Queen Victoria. Cunard president, Carol Marlow said: "The decision to order another ship for Cunard Line has been taken as a result of the strong booking response to the new Queen Victoria. "We are delighted that the Queen has given her blessing to our calling this new Cunarder Queen Elizabeth, after our first vessel of that name. "We are extremely pleased that Cunard will once again become a three-ship fleet so soon after the departure of the much-celebrated QE2 in November next year." 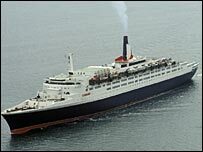 Cunard said that the Queen Elizabeth's maiden voyage will be in the autumn of 2010.